Where does the time go….? After no weight gain last Monday, I’m nervous about our visit to Dr. Ebba this afternoon for her regular check up. She’ll show some weight gain since we saw him last but I am looking for weight gain in the last week. I never thought I would be praying for weight gain…ha! On Friday, Bryan and I had a great day at two of Neely’s appointments. First up was with Dr. Lose, the geneticist at UAB. He was super nice and personable. He said that while all the doctors want to tell you about all the things that can be wrong with your DS baby, he gets to tell you the fun stuff! he even pointed out that they memorize traveling routes really well. So if we take a different route to get to a common destination, Neely might stress because she’ll think we are lost! I’m counting on her to help her directionally challenged Momma!!! he said Neely would never forget a birthday! he pointed out all the areas where we can have the same expectations we have for our other “typical” children. they very rarely develop type 2 diabetes. very rarely suffer from heart attacks or strokes. 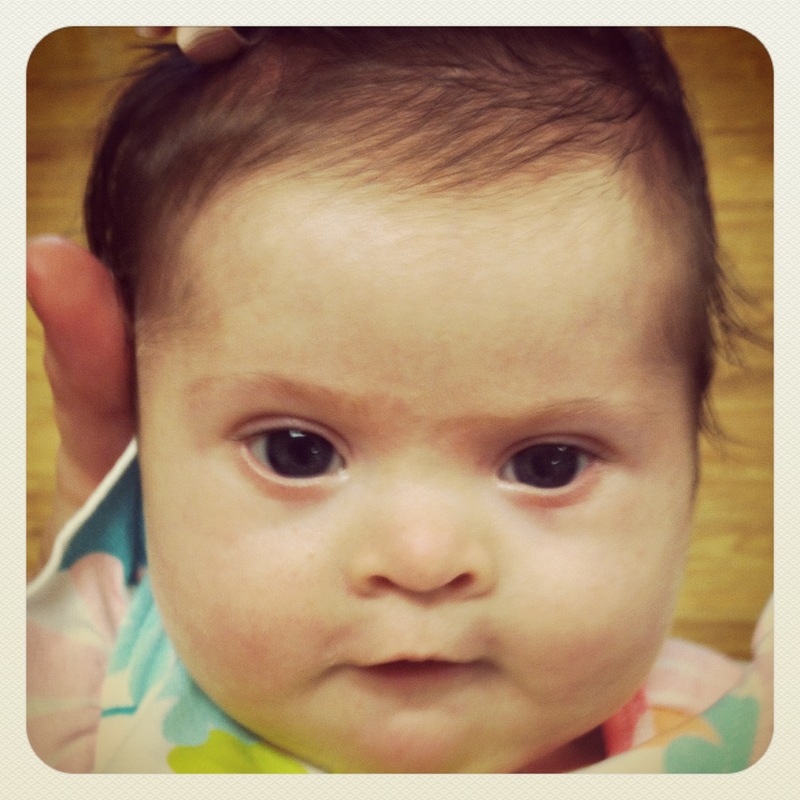 And so many more wonderful things that come with Neely’s Down syndrome diagnosis! We did find out that Neely has the true Trisomy 21 and not Translocation. We had a quick lunch at one of my old favorite Chinese restaurants, The Dragon. We decided it wasn’t as good as we remembered but we still enjoyed our lunch together! Next we headed to the cardiologist, Dr. Carlo. At his office, Neely weighed 8 pounds 14.5 ounces. He asked about how much she was eating….and seemed a little less demanding about the official number of milliliters. Whew……. He said we could continue to stay off of the Lasix for now and her heart looked great…still holding it’s own with the defect and not currently building up pressure and doing damage to her lungs. Praise the Lord! He described a spectrum of babies with AV Canal and I asked where she fell in that spectrum…. His answer was the good end! The best possible scenario for her condition! Woohoo!! We certainly know based on previous cases that Neely’s health could start to deteriorate as she approaches her surgery date. Please pray with us that we take a “heart healthy” girl into surgery in October. We finished our day our with a yummy dinner at Chuy’s and headed home…late…we were worn out the next day! Sitting at home all the time is catching up with me! Whew…I need to start walking or SOMETHING!! I had a follow up visit with my ENT this morning and after the course of medicines he prescribed, I have had no “spells”. I kind of feel like one is about to happen a lot of the time but maybe that’s just anxiety about having another one. He gave me a prescription that I can take as needed for flare ups and we’ll see if it goes away on it’s own. On another happy note, my sweet girl has been nursing some without falling asleep! WooHoo!!!! Praying that she becomes a champ at it after her surgery and I pack up these bottles! Ha! Thanks again for your prayers for our sweet girl! God is so good!